Boxelder (Acer negundo) is a hardy and fast-growing, small to medium-sized, deciduous tree which is native to North America. 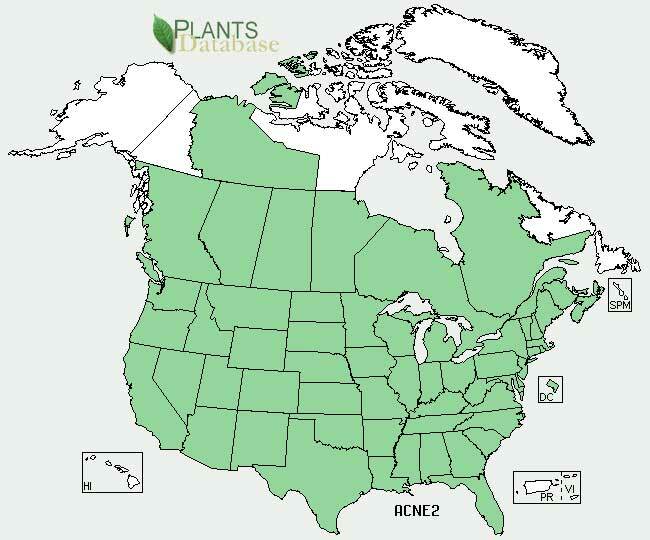 Boxelder is the most widely distributed of all the North American maples, ranging from coast to coast and from Canada to Guatemala. 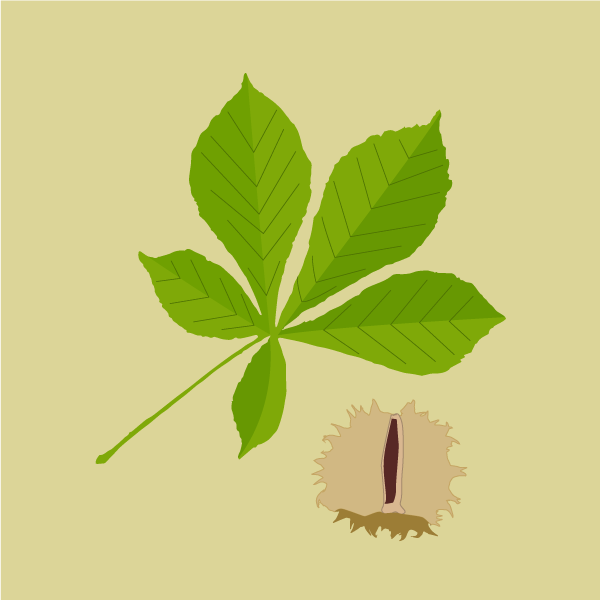 It is often planted as a shade tree. 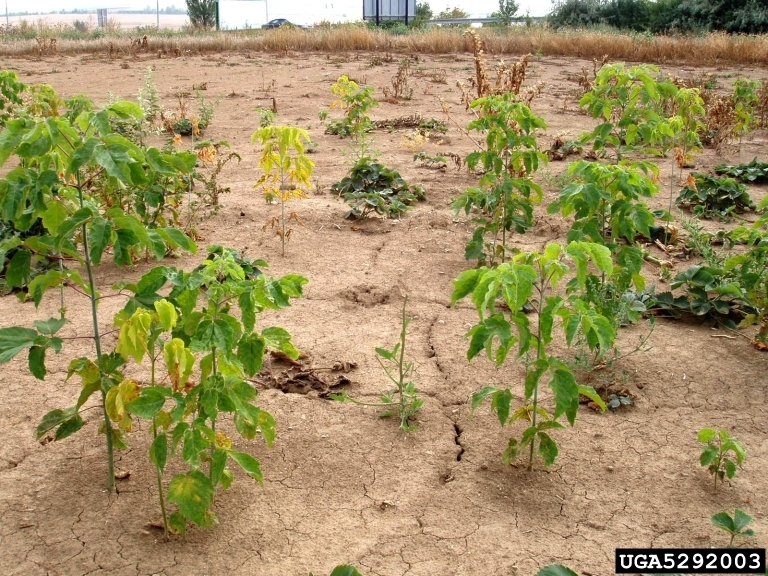 Boxelder tends to prefer growing in wet lowland areas, such as floodplains, river banks, and moist disturbed areas. Height: Boxelder trees can grow up to 75 ft tall. 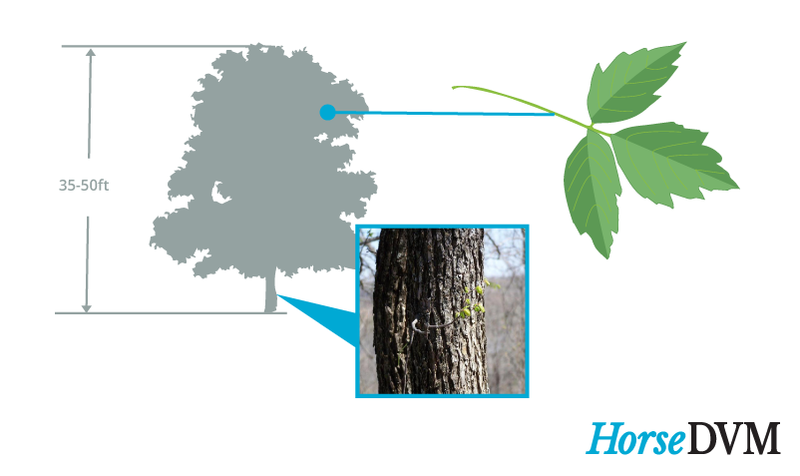 Root System: Boxelder has a shallow and spreading root system. Bark: Boxelder bark is gray to light brown, darkening and becoming more finely grooved as it ages. It's trunk is usually 2 to 4 feet in diameter, branching just above the ground to a wide, open, irregular crown. 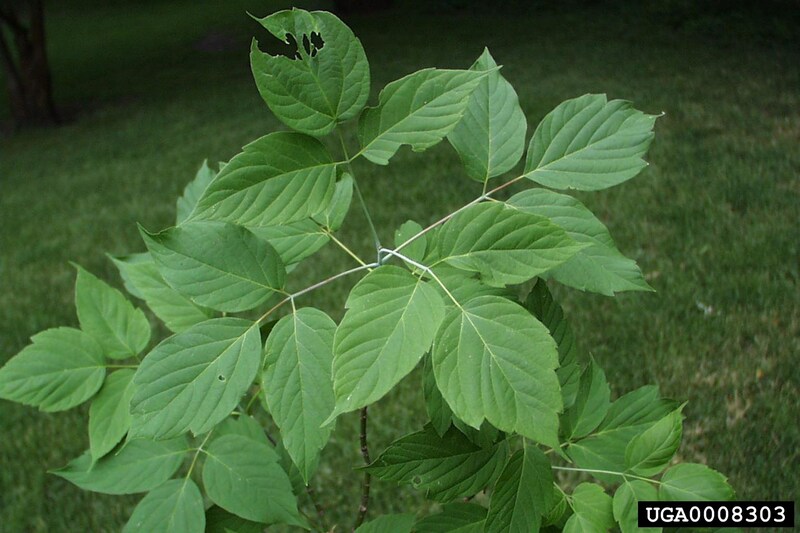 Leaves: Boxelder's nickname, 'poison-ivy tree' came about due to its 3-parted leaves, which resemble those of poison ivy. 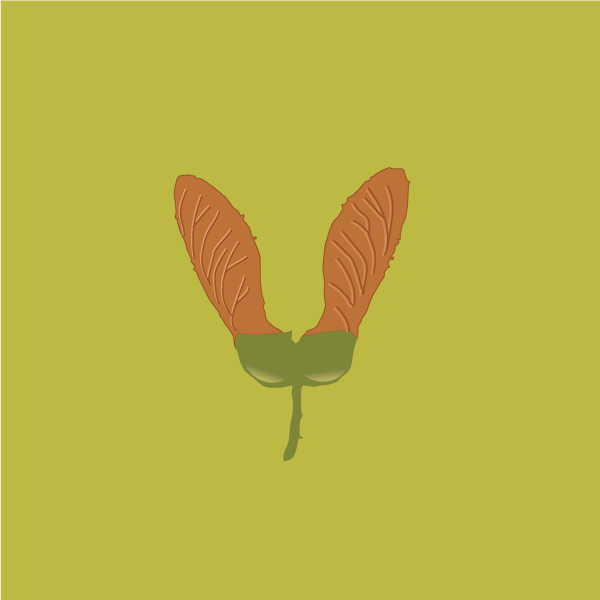 The leaves are green, compound, irregularly-toothed leaves that appear within 4 to 10 inch long, oval-shaped leaflets (usually 3 to 5 and rarely 7 to 9). During the fall, boxelder tree leaves turn yellow prior to falling from trees. Flowers: Flowers develop in April to early May, prior to the leaves appearing. Flowers look differently depending on whether the tree is male or female. 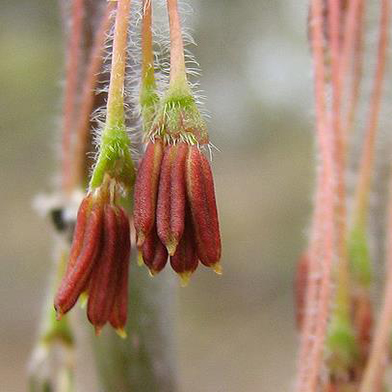 The male flowers are borne singly on thread-like, clusters of drooping stalks. The female flowers are often grouped together within a shared stalk, which forms a dangling cluster of flowers. 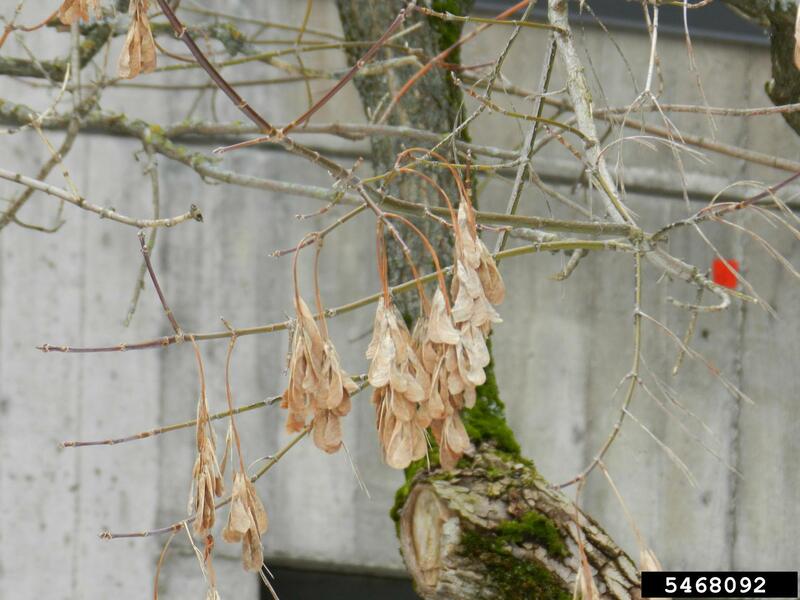 Fruits: Boxelder produces tan-colored, 2-inch long samaras, arranged in pendent clusters and attached in V-shaped pairs. 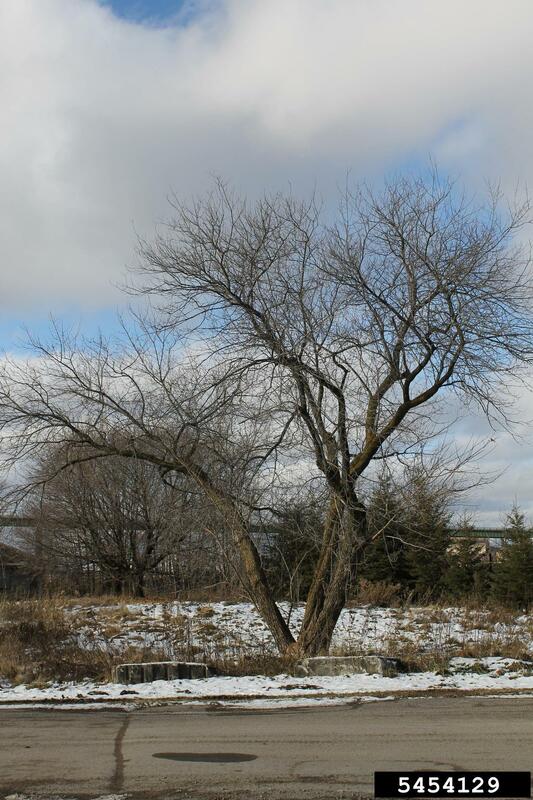 Fruits mature in the fall months and will often remain hanging in clusters on the branches throughout the winter months. 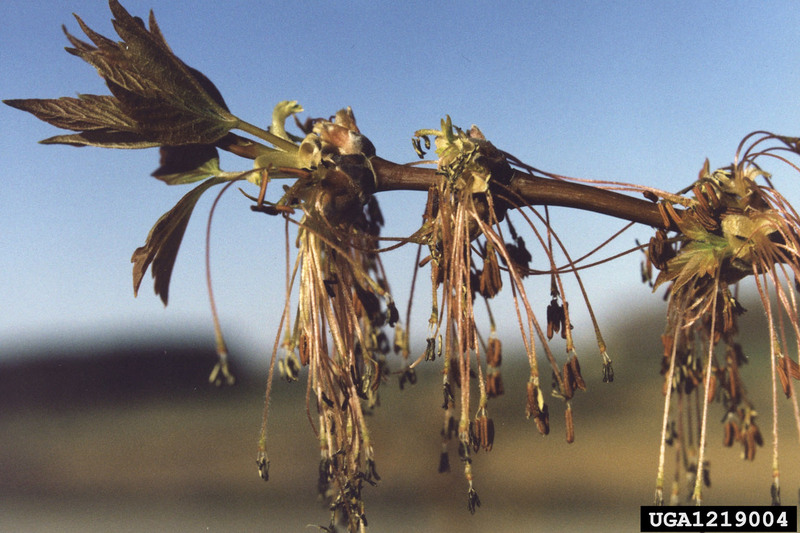 The seeds of the box elder tree contain the toxin hypoglycin A which is responsible for causing seasonal pasture myopathy in horses. Horses which ingest the seeds develop signs typical of muscle 'tying up' disorders and progresses rapidly, with 75 percent of the horses which develop signs dying within 72 hours of ingestion. MECHANICAL CONTROL: hand-pull or use a trowel or shovel to loosen up the soil and dig up the roots. It is important to remove the entire root system or re-sprouting may occur. 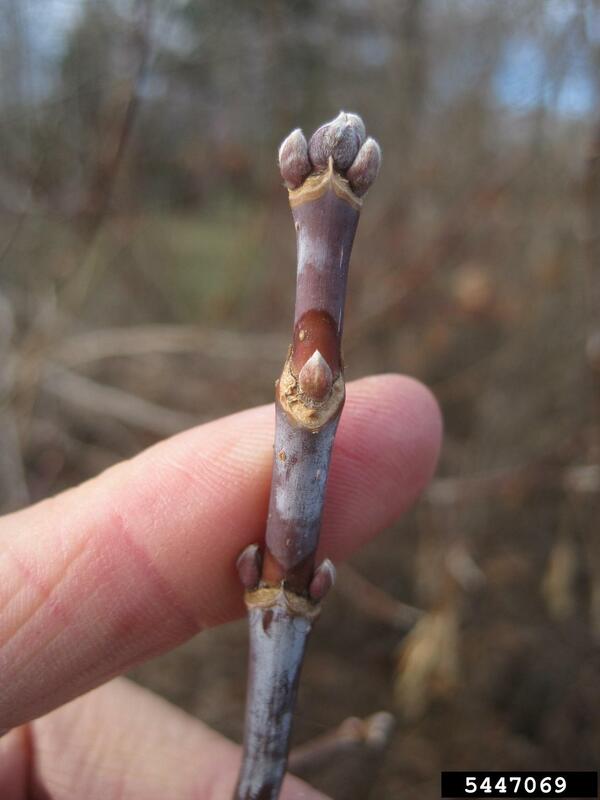 If the plant is a small sapling, cut the stems close to the ground and remove all stems and stalks from the area. 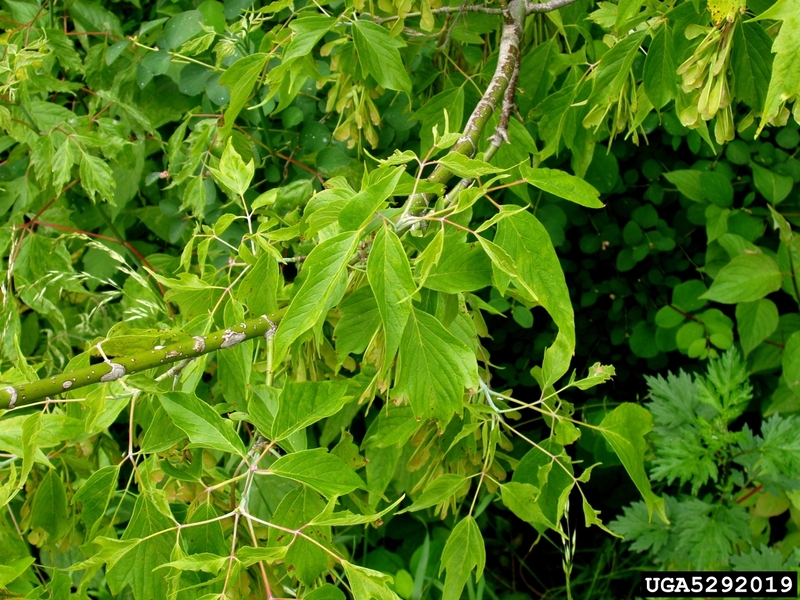 CHEMICAL CONTROL: Boxelder is highly sensitive to 2,4-D.
USDA SPECIES: Acer negundo . 2018. 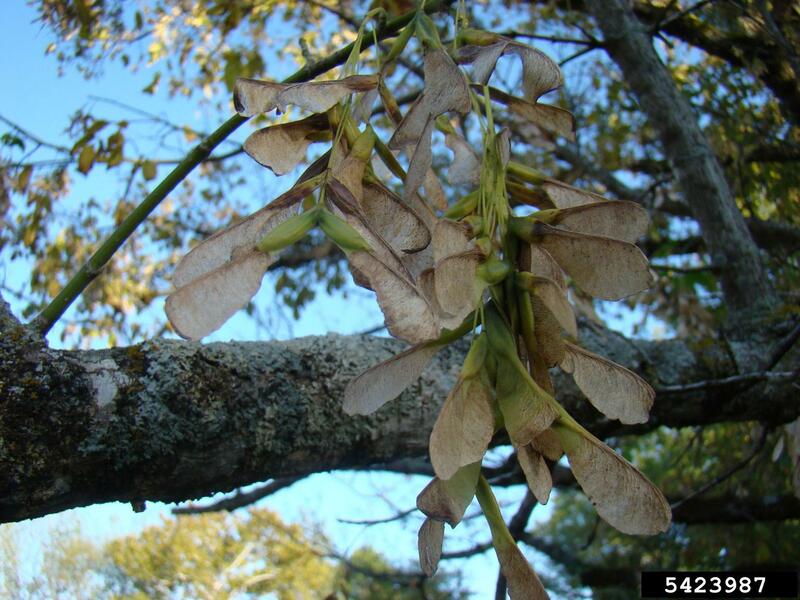 McKenzie, R. K., et al Detection of hypoglycin A in the seeds of sycamore (Acer pseudoplatanus) and box elder (A. negundo) in New Zealand; the toxin associated with cases of equine atypical myopathy. New Zealand veterinary journal. 2016. D Giblin. Acer negundo Burke Museum of Natural History and Culture. 2015. Votion DM, van Galen G, Sweetman L, Boemer F, de Tullio P, Dopagne C, Lefère L, Mouithys-Mickalad A, Patarin F, Rouxhet S, van Loon G, Serteyn D, Sponseller BT, Valberg SJ. Identification of methylenecyclopropyl acetic acid in serum of European horses with atypical myopathy Equine Veterinary Journal. 2014. 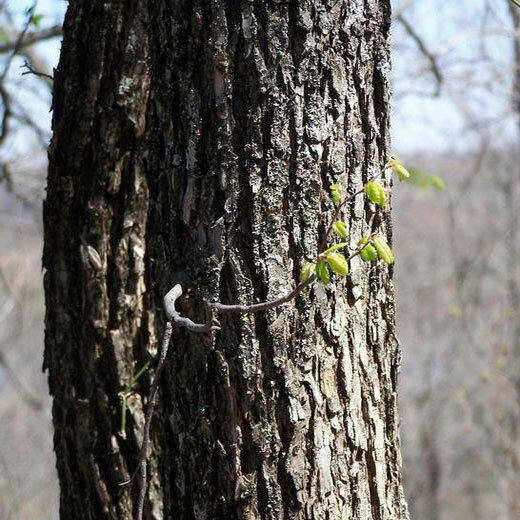 Box elder trees linked to fatal disease in Midwestern U.S. horses University of Minnesota. 2013. 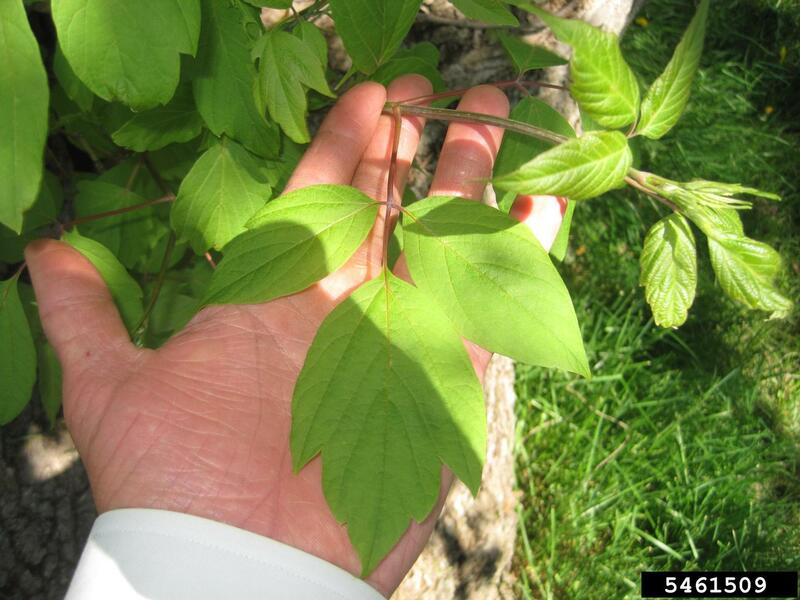 Valberg SJ, Sponseller BT, Hegeman AD, Earing J, Bender JB, Martinson KL, Patterson SE, Sweetman L. Seasonal pasture myopathy/atypical myopathy in North America associated with ingestion of hypoglycin A within seeds of the box elder tree Equine Veterinary Journal. 2013.